No appointment is necessary. Stop by the office sometime at Constitucion #26 and check out our new digs too! The interview will take about 15 minutes and we would very much appreciate your time and input. It will be posted on our website, YouTube channel and Facebook. You can share it with all your friends too! 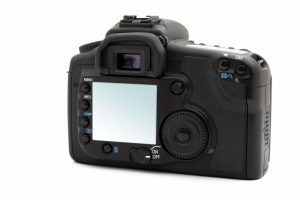 For those who are camera shy, we invite you to contact us with a written testimonial. Perhaps you could include your picture to make the testimonial a little more personal. My husband and I had a wonderful day with Michaela Sirbu from Lake Chapala Real Estate during our trip to Ajijic to see if we’d like to retire there. Michaela showed us several lovely houses and gave us tours of some gated communities. She answered all our questions and was a delightful person to get to know. We now plan to move to Ajijic when we retire. I highly recommend using Michaela as your real estate agent. Today, we will begin to live our dream. I am at a loss for the words to describe what your tireless efforts expended on our behalf mean to Charlotte and me. You chased our dream with us by visiting many properties at our request then relaying opinions and photos. When the correct property did come on the market you moved quickly to view then convey details that helped us make an informed decision and begin the purchase process. 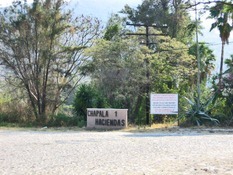 You, Nelda, and the staff at Lake Chapala Real Estate, maintained an open channel of communication with excellent details of the processes and my performance obligations. So, when we arrived from Texas and (1) first met you face to face, and (2) first set foot on a property I had paid for but only seen in photographs, there were NO surprises. Four days later we met with the Notario and proceeded with a very comfortable closing. Ajijic is now our new home. We are so very happy to be here. And I cannot imagine any of this happening without the professionalism you brought into this series of events. So our special thanks to you and Ricardo for the service and friendship. When Elizabeth referred me to you (Jeff McGaver) I expected that you would be a great Realtor (and you are), but the passion you demonstrated for finding my perfect house was above and beyond anything I’ve ever experienced. Rather than simply asking me where I wanted to live, we talked about how I wanted to live. Jeff McGaver is an attentive listener and put a lot of effort into understanding our priorities. This allowed him to identify the specific properties that would interest us. He found us the absolute perfect house! Jeff is very resourceful, proactive, responsive and detail-oriented. He has a broad network of contacts and ensured we had all the information we needed to confidently close our transaction. We give Jeff McGaver our highest endorsement and would be pleased to speak with any of Jeff’s prospective clients with further details. I just sold my house of 14 years in Upper Ajijic through Judit Rajhathy. She is by far the best real estate agent in Ajijic. She works out of the Lake Chapala Real Estate Agency. My place was sold in about 2 weeks from the time it was listed, while my neighbors waited 2 years for theirs to sell. I can’t praise her efficiency, dedication, and honesty enough. There is no better agent in Lakeside. The market is very tight for buyers and there wasn’t anything on the market we liked. That’s when Jeff McGaver really went to work calling other agents to find if they knew of anything not on market like we were looking for. He found a few for us to consider and took us out the next day. We walked in the first one I saw the view, started to cry and we didn’t need to look further! The offer and closing process was flawless as has been Jeff’s follow up in arranging for us to meet with property manager to care for our home until we move in January. His assistance to us has been amazing. We have come to view him as not only our realtor but our friend. Michaela Sirbu is the best Realtor in all of Lakeside! Words cannot express my complete gratitude and respect I have for this incredible person. THANK YOU! The wife and I just closed escrow on October 5th on our new house in Chula Vista Norte. Sherry Carter was our agent and I can’t say enough about how she made this one of the easiest and most pleasant real estate transactions we have experienced. Sherry picked us up at our rental and spent the entire day with us showing us at least a dozen houses and neighborhoods from the Chapala Haciendas to the Racquet Club, all in our price range. She did all of this while knowing we were not even sure whether we wanted to just continue renting. She even bought lunch! We had to go back to California to close escrow on the sale of our house there and she handled everything beautifully while we were gone. No un-dotted I,s or uncrossed T,s and anything that came up she was immediately on the phone to us. We came back and it was like we had never left. If you are looking for an excellent real estate agent you can’t go wrong with Sherry Carter, you’ll just love her. Michaela is a winning and knowledgeable realtor, one who is deeply invested in the welfare of her clients. She understood our perspectives and goals—and helped to make our dreams a reality. As US citizens, buying a home abroad is a complicated process, but Michaela guided us expertly through every step, from property negotiations to the banking system. She has a wonderful eye for both the fine details and the big picture. Highly recommended. She is also a very lovely and charming person! I want to thank both of you ladies for your excellent work on the sale of our house. 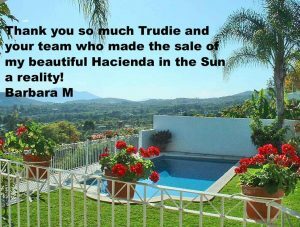 Judit, I can not believe the number of showings you arranged and work you did in finalizing the sale. Barbara, the work you did and the help that I got from you was fantastic help in getting the POA. Without your help I don’t think I would have gotten through the process. Tremendous support. Beth and I were so pleased with the professional manner that we witnessed. Great Job. We were not the best clients kind of picky but on a limited budget. Eva showed great patience with us and worked hard finding us just the right place. First she showed us different areas and there are many. She had good knowledge of them from Jocotepec to Vista Del Lago. We would give her names of houses we had seen online and she would throw in some she knew about. Day after day 3-4 days a week we would go to the office and she would cheerfully greet us and offer water and off we went. She also had flyers ready for the days search. Sometimes we were a little depressed since we had looked at so many places but Eva would cheer us up and told us that when the right one came along we would know – and it did. Letty and I highly recommend Eva. She didn’t quit when we found a place. Eva helped us with money transfer, closing, getting utilities transferred, keys and more. 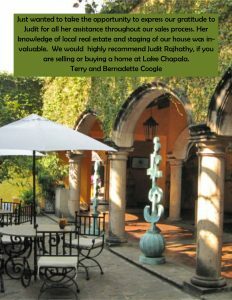 I would highly recommend Lake Chapala Real Estate to anyone seeking to purchase a home in the Lake Chapala Area. I found the agency to be professionally run, competent and ethical – which is not always the case in Mexico, as there are currently no rules/laws/certifications in place for real estate agents here, with all the possible dire consequences thereof. Evangelina and Raul (the agents I worked with) went out of their way to make my acquisition happen, ironing out several stumbling blocks and even finding a private lender to float a small mortgage for me for a reasonable price – an almost impossible task for a foreign buyer. Evangelina also took care of all the minutiae surrounding the sale, like putting the electric and phone bills in my name, helping with Internet set-up while I was out of town and generally always being willing to help with any questions I had and issues that cropped up. And always with a smile on her face. From what I saw, the agency is run with high standards and an eye towards due diligence. The agents are very knowledgeable both about the local real estate market and real estate legislation and they combine this knowledge with small-town customer service – almost a lost art nowadays. My experience with this agency was a very positive one and I therefore do not hesitate to recommend it to anyone thinking about relocating to the area. My wife and I moved to the Chapala/Ajijic area from the Baja. We did not know much about the area in terms of communities and available real estate. 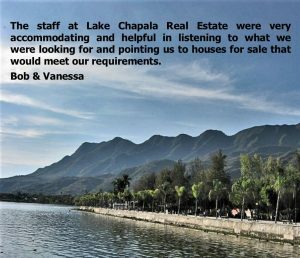 The staff at Lake Chapala Real Estate were very accommodating and helpful in listening to what we were looking for and pointing us to Houses for Sale that would meet our requirements. In our travels from one viewing to another we were given an education about the various areas and what they had to offer us. Lake Chapala were there from start to finish in our search and purchase right through the close of sale. We in fact looked at some 40 houses, and their only concern was helping us find a home that suited us. We can best describe Lake Chapala Real Estate’s support to us as a complete service, including providing information that helped us to adjust to our new community and offering some ideas that helped us see the potential of ideas for planning renovations. Our thanks to them for all their assistance. We were extremely happy for their help. After trying unsuccessfully for five years using several real estate offices in Ajijic to sell our home. Marvin Golden, and the Lake Chapala Real Estate team, accomplished it in a matter of weeks. 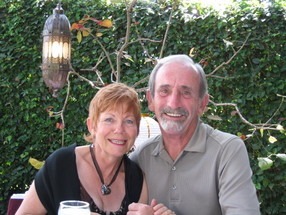 Marvin and Barbara provided excellent exposure, and the most effective marketing. Their honesty and integrity is beyond reproach. Evangelina provided us with a very professional and successful closing. We are so grateful to her all the hard work. My name is Adrian Limon, son of Gabriel Limon Olivares, whose home was just sold with the assistance of Ms. Evangelina Valladares and the team at Lake Chapala Real Estate. On behalf of my family, I felt it was important to write you and express my gratitude and appreciation for the work and special efforts made by Evangelina Valadares and the support staff at your office. My father had mentioned last year that he’d put the house up for sale and his hope was to sell it, and move back to California to be with his children and grandchildren, where he could be surrounded and loved by them. After multiple phone calls with him over some months, and him sharing that he was feeling quite discouraged with the selling process I intervened and decided to take the lead on getting his home sold. With my direct communications with Ms. Valladares, she was very attentive to my emails, my questions, and empathetic to my frustration of trying to coordinate this via email, a country away, with a little bit of a language barrier. Through her lead, Ms. Valladares arranged a notary and lawyer to secure power of attorney for my cousin, so she could sign paperwork as needed upon my approval. In addition to those efforts Ms. Valladares also helped to coordinate communication with the gardener to advise him that he would have a severance package upon completion of the sale, as well as helping to secure and protect the property while it was unoccupied. I can honestly say that I am completely overwhelmed and humbled by all Ms. Valladares did for the benefit of my father, and ultimately his family. Her encouragement, her follow-up, the management of the selling process, and working with my cousin and I do get everything signed and in order is nothing short of a miracle. Throughout it, she has done it with a smile and a professional, yet personable demeanor that speaks very well of her. But it also speaks well of your company and support staff, because this sale required involvement from many others, especially when power of attorney needed to be created. 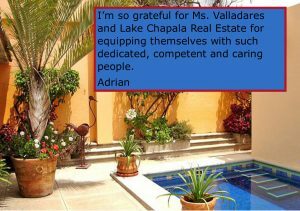 I am so grateful for Ms. Valladares and Lake Chapala Real Estate for equipping themselves with such dedicated, competent, and caring people. To my father and our family, the greatest gift you’ve given us is an opportunity to reunite as a family, and it was made possible by Ms. Valladares and Lake Chapala Real Estate. In closing, I’d like to ask one favor; that you would please take a moment to recognize Ms. Valladares for her extra-ordinary efforts, and the commitment and perseverance she demonstrated throughout the sale process. As someone with a long career in the sales profession, it’s always a creed of mine to recognize those who demonstrate such dedication to their clients, so I hope you can do the same with Ms. Valladares. I have been looking at the Chapala area for a couple of years now. I came to visit on a Focus Tour and loved it. I Decided I this was the place for me. Evangelina and the Lake Chapala Real Estate team were great. Not only did she find me the perfect place but Eva and her team helped me through all the aspects of buying a home in Mexico. I would recommend Eva and her team to any one looking for Real Estate assistance. They have gone above the norm and Given excellent service. Thank you for everything you have been great. Our friends bought from Marvin and they highly recommended him. We found a fixer-upper on a large lakefront property. Marvin helped us get the house for the price of the land only. After extensive renovation we have a beautiful home at a great price. us. We could not have done it without you and your great team. of the Mexican people in the Las Pintintas community and beyond. We thought we were too old to buy when we came to Lake Chapala, Mexico. Barbara and Marvin found us a year long rental and we settled in. As we got to know them better we didn’t feel so old and they helped us realize that buying was much wiser financially. They helped us get a dog and a great home with a lovely yard. I had a house for sale and Marvin brought the buyer. I was so impressed with how he handled the transaction that I listed the next house with him. Again he found the buyer and I was very pleased with the transaction. I bought a home in El Parque 18 months ago for $79,000 USD. The development was just starting, the streets were a mess and construction was everywhere, but Marvin helped us to look past that and see the future value. Now, over 105 homes have been sold, most are built, the pool and clubhouse look great. Recently Marvin sold it for me for $133,000 USD. In June 2005 we came to look at homes in Ajijic, Lake Chapala, Mexico. We fell in love with a home for $325,000, but were not able to move until 2006. Marvin helped us negotiate a closing in March 2006, and was able to save us $23,000. We can’t wait to move. We decided to sell our home and called Marvin for an Opinion of Value so we could get an idea of price. We told him our wish list: We wanted to sell now but not move for about 15 months! We were building a new house and have two dogs and didn’t want to move twice and have to rent for a year.. He said he was showing clients the next day in our price range. As it turned out, his clients were only looking as they weren’t able to move to Mexico till a year or more. Marvin quickly put two and two together and brought them to see our home. Then we sat down and discussed our respective situations and got a feel for what each others needs were. Then Marvin left with his clients and structured an offer that worked perfectly for both buyers and sellers. We couldn’t be happier. It was a complex contract and few others could have put this particular deal together. 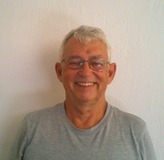 Marvin, you are truly a professional and an experienced Realtor capable of looking after all your clients needs. You cannot help but be successful as you put your clients’ needs ahead of your own. We called you because of the incredible marketing you do for your listings – Home Books covering every detail of the property, full color Feature Sheets and all the added promotion you do. By doing this you get to know your listings inside and out and are clearly in a better position to properly promote them. I know the new buyers were thrilled with the Home Book as it allows them to show their family and friends their new home in Mexico, even though it was prepared after they actually purchased our home. Another important part of the equation is Barbara, and we can’t thank you enough for all your hard work. Barbara works behind the scenes creating all the marketing materials – Home Books, Feature Sheets, advertising etc and looks after all the paper work for the closings. Since we had a quick closing, Barbara had to go above and beyond getting all the paper work together in time – Power of Attorney and Apostile, going back and forth with the buyers in the States and the Notario here in Mexico. There is an incredible amount of documentation required to close a transaction in Mexico and Barbara makes it seem easy and seamless. We can’t thank you enough. Everything worked out perfectly. I came to Ajijic, Lake Chapala, Mexico to find a place to write. I wanted a home and an investment. El Parque was just getting started and the prices were excellent. Marvin helped me have a home built and a year later I moved in. A few months later I bought a second home and I am now referring others to Marvin and Barbara. When I came to Lake Chapala I was not ready to buy, I just wanted to check out the area. Marvin sold me on the area with his tour. I liked the people, the activities, the prices, the restaurants and the weather. A few months later I came back and Barbara found me a three month rental. I soon decided to buy and Marvin found me a great house. My wife and I had been paying attention to the Ajijic/Lake Chapala area in Mexico for the last 5 years or so. 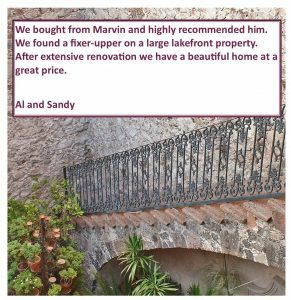 When we decided to move to the area, we looked online and found Lake Chapala Real Estate and contacted them to help with our home search. Barbara Garding from their office spent every day, for one week, helping us understand the area and showing available homes in our price range – thank you Barbara, you were a wonderful help. As it goes, we found what would be perfect for us on the last day, which left us negotiating from our home in Canada. With the capable help of Barbara, our selling agent, and the agency owners, Barbara and Marvin, we came to an agreement on price with the owners – thank you everyone. Contacts, forms and lots of paper work followed and we had the best, Eva Valladares, part of the office staff at Lake Chapala Real Estate. Eva responded quickly to our emails, had everything in order and attended at the closing. Everything went smoothly and we left owning a new home in Mexico. Thank you to everyone at Lake Chapala Real Estate. 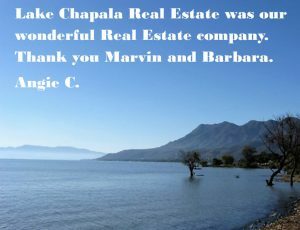 My wife and I had the good fortune to work with Marvin Golden and Barbara Mercik at Lake Chapala Realty this past year for the sale of our home in Chapala. Their professional expertise and friendly, thorough demeanor allowed us to sell our home in a very reasonable amount of time and for list price. The negotiations went in such a way as to satisfy us as sellers as well as to assist the buyers in answering their questions in a timely fashion. The professional attention continued well past the close of escrow with no complaints at all. 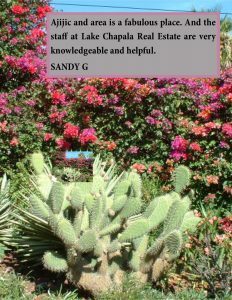 We highly reccomend the sales staff at Lake Chapala Real Estate. We have been wanting to write a little thank you note for all your assistance in getting out first house in Chapala almost four years ago and again, few months ago when we decided to buy the second one here in Chapala too. I remember vividly the first time we met you, you took us to see various house, many we didn’t care for and others we could not afford, you always had a beautiful smile in you very pretty face and you were always courteous, never showed a sign of discouragement or boredom, this went on for a full year and after that year, we got the house that 12 months earlier you had said: I found the house for you! You were right, we loved it but at that time we could not afford and you know the reasons But here we are now, enjoying the house you picked! One important detail in this matter is that I remember after a few times we looked at many and different house, we were amazed how amiable and nice you were to us and I told you: I promise you, we are buying a house from you and nobody else and we kept our promise. Not only we bought the house from you but we bought a second one, little and simple but still, we did buy from you and we appreciate you assistance and your desire to keep us satisfied with the buy. But the best of all, is that you are one of our closest and dearest friends in Chapala and that gives a lot of satisfaction and happiness. God Bless you Eva Luna and thank you very much!